IW Hockey reviews the Bauer Vapor X500 skate. 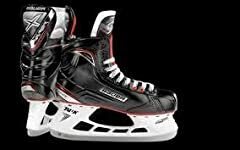 The Bauer Vapor X500 Ice Hockey Skates are a great choice for a recreational to intermediate level player. The Vapor X500 skates are the first model in this Vapor Line to showcase the innovative Tuuk Edge Holder. This Edge Holder has a quick release trigger system that allows players to swap out broken or damaged steel in seconds, while also offering one of the tightest turning radius’ around. Hi Chase how do these compare in stiffness to the Supreme s160 ? just bought these the other day. haven’t got to step on the ice with them yet but they fit great. I threw black laces on them. I’ve had these a couple months now and the stiffness of the boot for the low price point is phenomenal. They feel pretty light and the taller holder and quick release steel is a nice addition for the price point. I switched out the stock insoles with an old set from some Nike Air Max shoes, I trimmed them to the size of the OEM Bauers and they worked out great. The stock Bauers are so thin and offer next to no arch support. My first game with the Nike insole was this past Monday night and the skates felt great and my feet didn’t have the achey pain that was present before switching them out. I might try putting wax laces on to better lock my lace tension in place. Right now I find that I have a small window of them being too tight and causing numbness, or being too loose. My only gripe is how easy the exterior gets gashed during games. I have had to use super glue to repair 3 or 4 separate gashes that have occurred from a puck hitting them (yes the edge of the puck tore the exterior, I looked at my skate after I blocked the shot and saw the gash), as well as other skates and possible stick contact to the boot. where can i get cheap x500 skate? should i get these or the ccm jetspeed 260? If i want to ship them to singapore,how much will it approximately be in us dollars ? 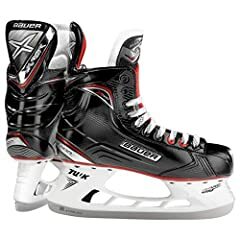 Chase I need alil help I am stuck on getting the Bauer nexus N700’s or getting the Bauer x500s currently I own the Bauer one.7 and lookin to upgrade can anyone tell me the difference between them? I’m currently using vapor x40 skates, so I have a generally narrow foot. The x40’s worked great for a skate that helped me develope some good motions, but they’re no longer supporting me the way I want them to, as far as stiffness/durability goes. $200-$260 was the price point I was looking to pay for some new skates. I’m just looking for something to really wrap around my foot, and to give me much more support and to be more responsive. Would you recommend these skates to me as a good upgrade from the x40’s, with durability? Hello, i was looking at these but i need a wider size. How much width does the EE size add compared to the standard D? Does it increase width of the toe box? Thanks again! just got these!! do you think they are good for peewee AAA tryouts ? Are you able to bake these?? What skate would you recommend to get, Bauer vapor x70 or vapor x500? Bought these yesterday. Cant wait to take them for a spin! I’ve been Inline Skating for over 5 years now and I think I’m going to buy my first pair of ice hockey skates. I play on inline teams already and since I just turned 17, its basically too late to get into the ice hockey game/teams, but I’ve always wanted to maybe play some pickup games with friends or just try out ice hockey by myself. Looking at either these skates or the X400, but I’ll see! Really love the reviews from this channel. Everything is always explained in great detail and Chase really does an awesome job. Keep doing what you’re doing!! I was wonderin,i want to buy a pair of vapor X500 by bauer are you able to ship this to singapore ? Hey Chase, can you tell me what is the difference between these and the Bauer Supreme 170 15/16 model? 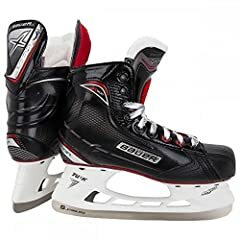 I am currently skating recreationally in Bauer React, and one of those two is gonna be my first ‘real tight’ hockey skate. I would like something real agile as I want to start attending local freestyle club and I’ve heard vapors are best for that. But seeing Supreme 170 being much more expensive normally I am wondering whether that might be better? They are at the same price point now due to some sales where I live. is there a huge difference in steel from these to the better models and what difference does it make?